As the years pass by, decade after decade, all of us will face health concerns just simply due to aging. Add to the aging process...using your arms every single day to get around as one would use their legs and you have a recipe for pain! Who knew? Perhaps if we did, then just maybe we would have made some different choices, to avoid possibly, some of what we are experiencing now. Oh, who am I kidding, with my impulsive personality, thinking beyond the now, isn't "natural," so most likely, I wouldn't have done anything different. But hey, that's just me. Hopefully, that someone "out there," may glean something useful to apply to their lives. After all, who wouldn't want to avoid causing themselves future pain and discomfort, if they could prevent it? Or if you have a loved one living with a disability and may benefit from knowing what we have learned (and are still learning), keep reading. For individuals like my husband Craig, who have been using their arms as their number one method for mobility, pushing their wheelchair every day...year after year...Craig has developed severe shoulder pain. Turns out, the wear and tear of daily wheelchair use, is the cause of pain for many of our peers who also use manual wheelchairs. As logical as it seems, it is not something either of us ever anticipated. In Craig's case, the pain was exacerbated when he accidentally tore his rotator cuff. 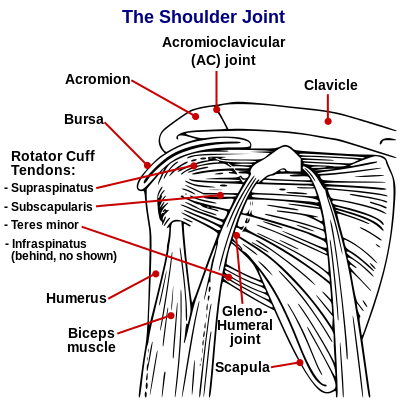 For anyone who isn't sure what the rotator cuff is, here is a diagram I found on Wikipedia, click here for more. Which reminds me, make sure your wheelchair brakes are always nice and tight. Craig wouldn't have damaged his shoulder if he had maintained his brakes, a lesson learned the hard way! At almost sixty-two years old, Craig has been assigned daily shoulder stretches to assist in healing the damaged rotator cuff. Through all of this he learned that even without the sudden injury, he still would have had to face shoulder pain. As the months go by, the pain is slowly lessening but because he still needs to use his shoulders daily - he can never truly rest. This is why he is now considering something called "power assist wheels." Being a power chair user myself (different than power assist wheels), I originally was concerned he could lose valuable muscles. However, knowing what we do now and witnessing his troubles, it seems a very viable alternative to increasing wear and tear. So we have begun researching just what type of assist he should consider and that is what we want to share here. We have posted below, some videos of three types of devices that we have seen so far. It is something you may want to consider if you too, use your arms for legs. If you can avoid the long term damage, what a bonus that would be. This is a power assisting add on drive. The device is added to your manual wheel hub area and permits you to push your own chair, and yet assists you up and down hills safely. This means you can still exercise your muscles but you can select the degree of assist you want via a remote control. This device seems preferable to some other devices that are available. Check it out here.